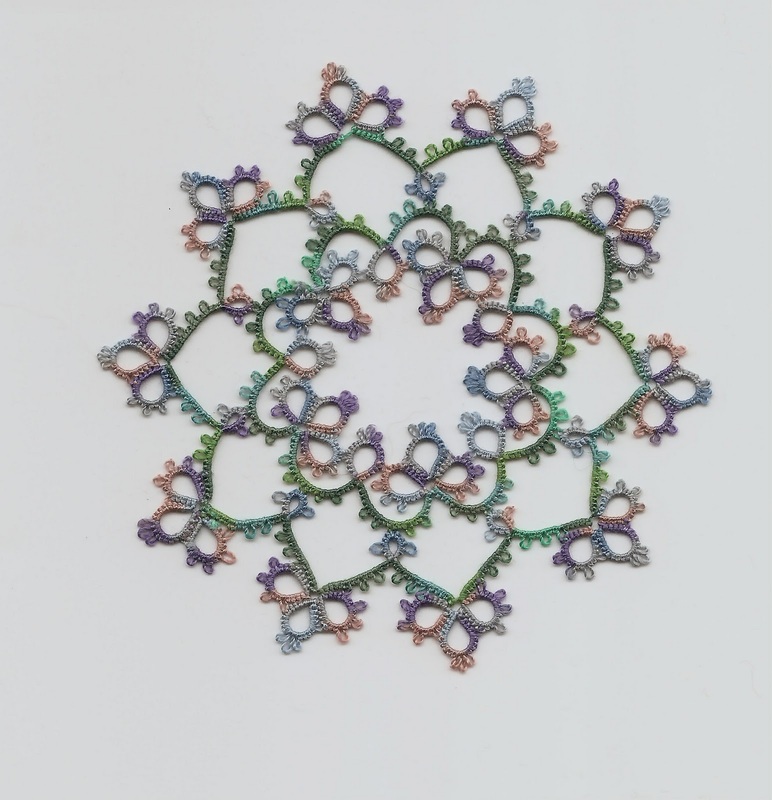 I know I said I didn't want to continue with these threads, but on the way back from Perpignan, puppy was quiet in her corner, and so I pulled out my tatting bag, and found I only had these threads, also no pattern. I was able to download round two with my phone...which seems to me to be amazing. I am afraid I did have a bit of difficulty interpreting it on my phone screen, and so the stitch count may be a bit off, also am I the only person who finds Sulky thread almost impossible to un-tat? It starts to fray very quickly, and I am scared it will snap, so I just carry on even when I have made a mistake, repeating it, if necessary to prevent it from being too obvious. Here is the puppy, watching me in the car. She is amazingly good, no messing in the house, and no crying at night. She and Bess get on fairly well, although Bess can a tad bouncy for such a tiny pup. The other photo shows the two of them together. The second round looks lovely, and yes, I have had trouble with the Sulky fraying. I think it depends on whether I slip my needle in the right spot. Of course, most often, I do not! Your puppy is beautiful! I'm afraid I no longer have the patience to work with a puppy. Maybe I've been without a dog for too long... 17 years! I think that is my trouble, too. I have some extra-powerful glasses for tatting, but I don't wear them often, because then I can't see anything else. They are both beautiful - the puppy and the tatting. I have never lasted more than three month alone, when a beloved pet dies. Seems I need that kind of perfect, constant companionship, seeing as how I have enjoyed it for of the past 40 years. Lovely to see you tatting again, even though I do not know how you manage the small stuff so very well. I also have a cat, and chickens and an octadon, and a rather paranoid fish called Humbert, who hides away and only comes out when he thinks there is no-one in the room! j'adore le chiot ,j'ai un jack russel ! 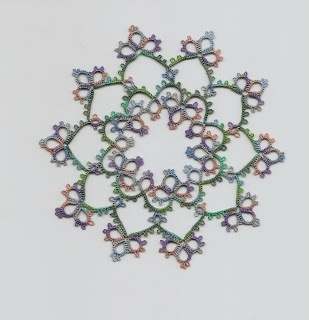 the tatting is very nice and beautiful color!